Modern houses are filled with various decorative objects, small or big furniture, cooking devices and a million other things, which may beautify our environment and make our everyday lives easier. If we could afford it, we would probably keep buying new stuff every day and, in fact, we wouldn’t know which ones to choose first due to the high range of options. Yet, regardless of our family budgets, we all invest on a nice looking sofa since it is, probably, the most necessary furniture within the house and for this reason it is also the most harassed. We offer sofa cleaning services in Huntington Beach, a city well known to most surfers in the c ountry since they can enjoy their favorite sport as well as the fabulous parks, the natural beauties and different activities close to the water throughout the whole year. We love the clean air in the natural environment, the purity of natural products and resting on the long and beautiful beaches and we simply want the same clean environment within our homes, too. No matter how thorough you might be with your private premises vacuuming every other day or dusting regularly, the daily use and time deteriorate the excellent characteristics of your furniture and some stubborn stains cannot be removed creating awful nestles of harmful microorganisms. Today, people enjoy their daily domestic activities in the living room without being afraid to sit on their couches or armchairs. In fact, you spend a lot of time on your sofa watching television, having a snack or drink, or playing with your kids and pets. The diversity of activities will, certainly, leave some marks behind like awful stains from your food or coffee, hair from your cat or dog, marks from the kids’ crayons or their shoes. If you add the usual social meetings with your friends and relatives, you will realize that your sofa has been transformed into a sponge that absorbs many elements and germs, unseen to the naked eye. We, at Carpet Cleaning Huntington Beach, aim to make your sofas not only looking clean, but we also provide deodorizing and sanitizing. We are not interested on superficial cleaning, which you could do yourself anyway, but we specialize on microfiber sofa cleaning for permanent removal of the stains and sanitization from the various bacteria. Our sofa cleaners have the proper equipment and expertise and training to engage on an overall cleaning service, which would have an effective outcome without destroying your precious furniture. 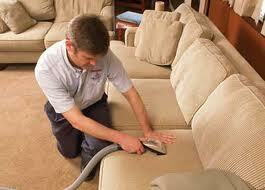 Couch cleaning relates directly to the aesthetics of your house, your hygiene and health. At Sofa Cleaning Huntington Beach, we have experience, eco-friendly detergents and the most qualified personnel to brighten up the discolored textures, sanitize your sofa and clean even the most hidden corners and restore possible damages, which may have occurred over time. We are aware that you may have invested a small fortune on your couch and, therefore, we take extra good care of its material and the whole cleaning procedure is done with great attention. Hence, you don’t have to worry about the children’s crayons anymore or enjoying a glass of wine seated on your sofa because the regular cleaning of our expert company can guarantee that your couch will always be as clean as its first day.